Were you surprised when you had kids about the cost of childcare? I know I was! Of course, now reading this article over on CNN Money about childcare exceeding rent cost, really did not surprise me after becoming a parent. In many cases especially with multiple children in childcare it can cost more than what you even make. 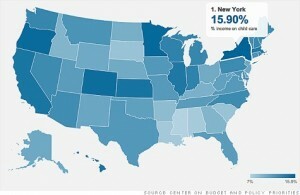 Head on over to CNN Money to read more on childcare costs.